Peter and I travel a lot with our kids and we hadn't gone away just the two of us in years, so last July we went to Martha's Vineyard for two days while my mom took care of the kids. The Vineyard is a quick ferry ride away from where our house is on the Cape, so it was easy to get there. The last time I'd been there was in the summer of 2009 when I was pregnant with Sam, so it had been awhile. It's a beautiful island and it was so nice to be back there again. 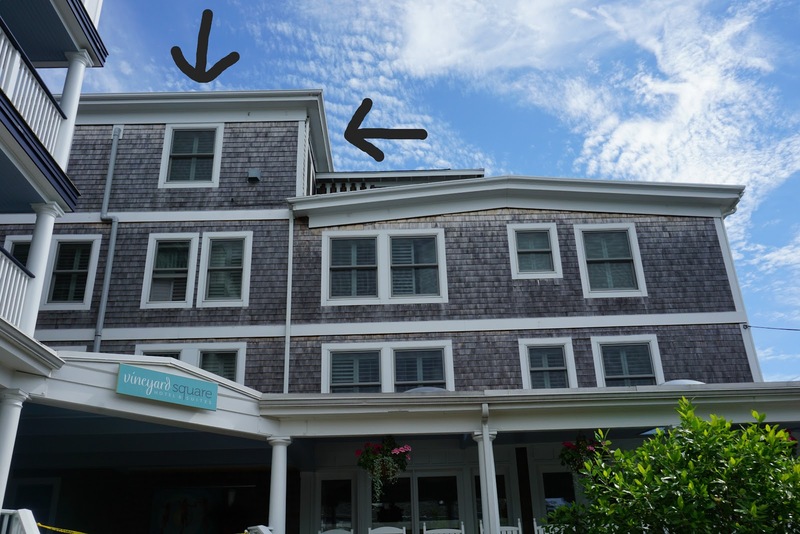 We stayed in historic and lovely (and expensive) Edgartown at the Vineyard Square Hotel. I was really happy with it; our room and the view were great, the complimentary breakfast buffet was healthy and delicious, and it has a convenient location right near the shops, restaurants, and water. I love this Disney-level attention to detail. This porch was two steps away from our room. Big wrap-around porches are one of my favorite things. We ate a delicious and rich seafood dinner at Atlantic. Speaking of rich, from our table we scoped out this super-swanky yacht named "Endeavour" that was parked outside. I like places like the Vineyard because they help keep me humble. There are always people richer (way richer) and higher up the food-chain than us (way higher up!). Not that it matters and not that we don't already know that, but it's still good to be reminded in real life because it helps keep your ego from getting too big. After dinner we walked around the downtown area, which is full of great little shops and restaurants. And lots of beautiful hydrangea bushes, of course. Edgartown Books was a wonderful little bookstore. Check out the owl in their logo! A Pinterest stairway come to life! I was very impressed by Edgartown. The next day we went on a tour of the whole island. Stay tuned!